Need a gift idea for Mother’s Day? In addition to flowers or chocolate—which your mom undoubtedly deserves—how about passing a policy that would give American families more economic security? 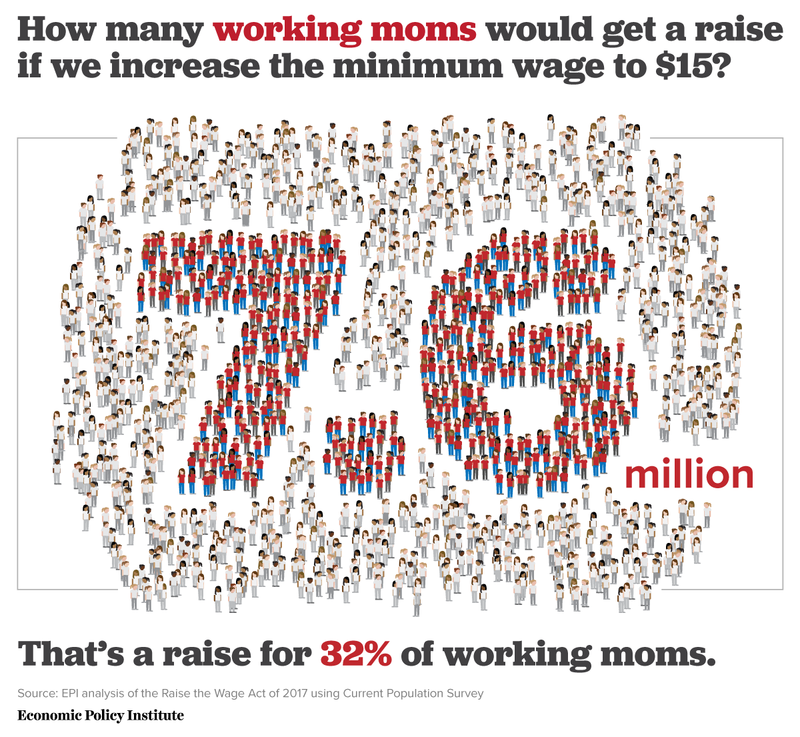 If Congress wants to give mothers the ultimate present, they should pass the Raise the Wage Act of 2017. Expected to be introduced soon by Sens. Bernie Sanders (I-Vt.) and Patty Murray (D-Wash) and Reps. Bobby Scott (D-Va.) and Keith Ellison (D-Minn.), the bill would raise the federal minimum wage to $15 an hour by 2024. Beginning in 2025, the minimum wage would also be indexed to median wages so that each year, the minimum wage would automatically be adjusted based on wage growth. The bill would also gradually increase the minimum wage for tipped workers (two-thirds of whom are women), which has been fixed at $2.13 per hour since 1991. The majority of workers helped by raising the minimum wage to $15 an hour (55.6 percent) are women. The gains are even more substantial for working women of color, 37.1 percent of whom would see their pay increase. Over 11.6 million working parents would receive higher pay under this proposal. Nearly a third of working mothers (7.6 million) would receive a raise and almost half of all working single mothers (3.6 million) would receive a raise. More than 19 million children would, therefore, benefit from an increase in their parents’ pay. To show our appreciation for mothers (and all hardworking people) this year, Congress should pass the Raise the Wage Act. To read more about how raising the minimum wage would help working people, check out this fact sheet.